Kikimora Studio presents Themed events, Fantastic Costume characters, Body paint, Art installations Design, Live Music acts,Circus,Acrobats,Arial acts,Stilts walkers,Fire performance,Glow show,World dance, Crazy Hour, Mime, Live statue. Wow! Thank you so very much for this wonderful review!! I deeply appreciate you took your time writing it!! Much love and blessings all directions to you! Mikimora performance was the best addition to our party. Very talented and dynamic professional. Her performance was outstanding and was very much enjoyed by all of our guest. I will highly recommend and will continue to use Mikimora for all of our future events. Thank you for making our party a success. Review by Mabel C. G.
The costumes are marvelous, skills are magnificent! I have never seen talent like this before; very versatile amd entertaining!!!! Great performance! Olga Saretsky is a fantastic performer. Very professional. She brought to the show creativity, energy, dance moves and costumes. She always showed up on time for rehearsals. She connected very well with the band with the singer and with the other dancer. I would highly reccomend her as a performer. Olga is a unique artist that will make your event special! I would highly recommend Kikimoramix for future events as are function was a huge success due to there ability to organize and help bring our vision to reality. All of our guests were immensely impressed with the stage production and the timing of each segment of the event. We are looking forward to working with Kikimoramix again in the near future. Avant garde performances trough Circus, Music and Dancing! Kikimora's performance company will take you on the ride of imaginary world by making You part of it! Interactive creatures, Fantastic unique designs, Fashion, Classic characters. Kikimora Studio offers one of a kind, fantastically imagined, elegant and upscale costumed performances often referred to as High Fashion Circus. These immensely inventive acts will assure your event is a stand apart from any other. Kikimora’s approach is for our highly skilled and uniquely qualified performers to actually transform the costumes into living creations to breath elegant life into your event. We specialize in miraculous main event and stunning spot light performances where something uniquely spectacular is requested. We’re also especially effective with walk abouts, meet and greets, and crowd interactions. 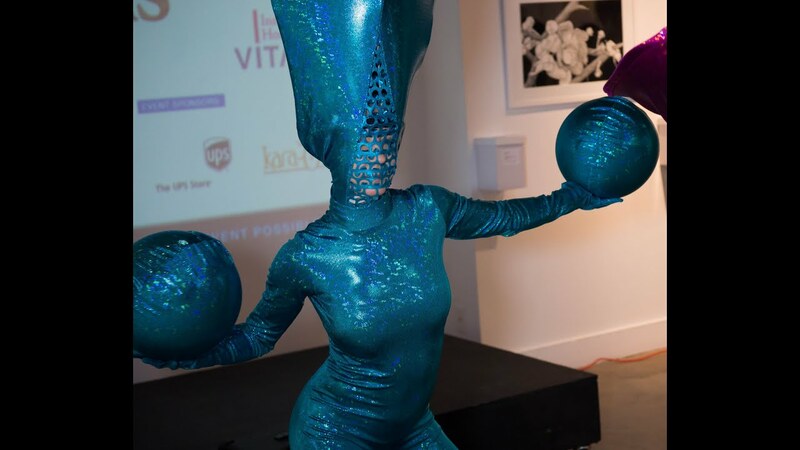 Our beautifully bizarre creations are sure to draw attention and generate excitement at your event. Kikimora pushes to impress with imaginative, daring and amazingly original performances. A Kikimora performance is characterized by an unmistakable style merging passionate creativity with graceful poise culminating in an explosion of unforgettable entertainment. New costumes, characters, and props are continually being imagined and added to the ensemble. You may choose from more than 50 creations, as well as numerous variations thereof, booking anywhere from just one performer to 20 or more. We also offer a vast array of genres such as aerialists, stilt walkers, jugglers, fire performers, poi, hoop, water performers, living interactive statues, acrobatic performers and dancers. All of which are available for main event acts, full stage acts, floor based acts, spotlight performances, meet and greets, crowd based interactive acts, as well as staged and spontaneous photo opportunities. We can offer various incarnations of our characters to fit your specific theme, or you can commission individually unique costumes to be designed and created exclusively for your event. We can help with ideas!! You can simply supply us with a few key words describing your event and we will offer you a complete package of ideas, possibilities and visuals. We can also offer recommendations on how to incorporate your company’s logo, colors, or concept into our shows and character costumes. In addition, we also offer a full spectrum of event dcor, sets, and props. Let Kikimora Studio’s professional, spectacular, and unique entertainment help to make your event extraordinary and unforgettable. Abstract art and visionary performances is our all time inspiration! Stage, Music system,Stage Light design.